A look at every NCAA Division I Men's Basketball Tournament first-round game where a 15-seed has upset a 2-seed. After falling in the first round of the Big East Tournament a week earlier, Syracuse once again faced an early exist. The then-Orangemen trailed the entire game. They had a chance to tie it in the final seconds, but guard Michael Edwards missed a three-point attempt from the corner and Richmond held on. The Spiders fell to No. 10 Temple, 77-64, in the second round, but they made history as the first 15-seed to upset a No. 2 seed. Santa Clara trailed by as much as 13 points in the second half before climbing back for an improbable upset victory. Arizona missed four free throws in the final eight seconds, and Damon Stoudamire missed a desperation three that would have tied it with one second left. The Broncos' run ended there, though, as they fell to No. 7 Temple, 68-57, in the second round. Coppin State had never won an NCAA Tournament game entering this David and Goliath matchup. In two previous appearances in the tournament, the Eagles lost by at least 20 to the likes of Syracuse and Cincinnati in 1990 and 1993, respectively. Coppin State was a 30-point underdog against South Carolina, the regular-season SEC champion. But it was the Eagles who dominated the favored Gamecocks. Coppin State held its own against No. 10 Texas in the second round, but the Longhorns made two great defensive plays in the final seconds to hold off the Eagles, 82-81. In its first-ever NCAA Tournament, Hampton pulled off an improbable upset. The historically black college had only joined Division I in 1995. Tarvis Williams, who scored a game-high 16 points, scored on a 4-footer in the lane with under 7 seconds left in the game to give the Pirates the lead. Iowa State had a chance as Jamaal Tinsely drove downcourt, but he missed a layup with just over a second left. The magic ended for Hampton in the second round as it lost to No. 10 Georgetown, 76-57. Kyle O'Quinn, a Queens native, had the game of his life for Norfolk State. He scored 26 points and had 14 rebounds to lead the Spartans to a win in their first NCAA Tournament appearance. It was the only win they'd get in the tournament, though, as the Spartans got crushed by No. 7 Florida, 84-50, in the round of 32. For just the second time in 16 years, Duke was eliminated from the NCAA Tournament in the first round. Lehigh's C.J. McCollum put on a show, leading the charge with 30 points, as the Patriots League champions earned their first NCAA Tournament win. The Mountain Hawks lost in the next round to No. 10 Xavier, 70-58. In its second year of NCAA Tournament eligibility, Florida Gulf Coast used a 21-2 run early in the second half to beat the Hoyas. FGCU then beat San Diego State to become the first 15-seed to reach the Sweet 16. The run ended there with a 62-50 loss to No. 3 Florida. 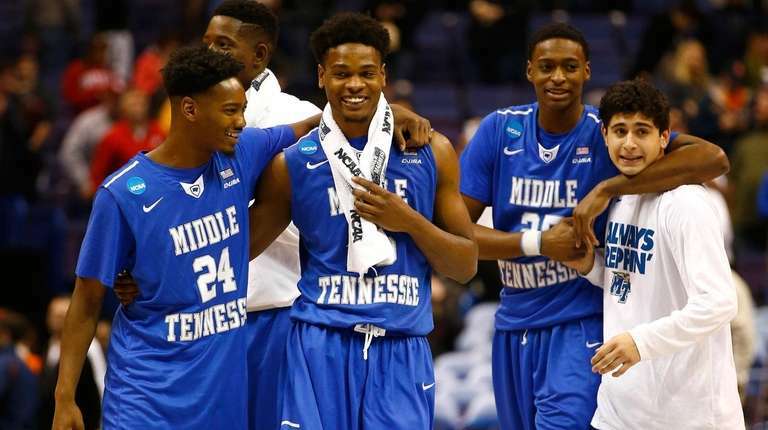 Middle Tennessee never trailed against the Spartans. Reggie Upshaw Jr. led MTSU with 21 points. The Blue Raiders lost in the next round to No. 10 Syracuse, 75-50.